Costume Party is located in Starkville, Mississippi; home of Mississippi State University. We have been in business since 2008. We rent and sell costumes and costume accessories - such as hats, masquerade masks, face paint, tattoos, boas, tiaras, birthday hats & sashes, wigs, sunglasses, crowns, and so much more! We rotate our inventory frequently so you need to come in often! We work with school groups, theatre groups and individuals. 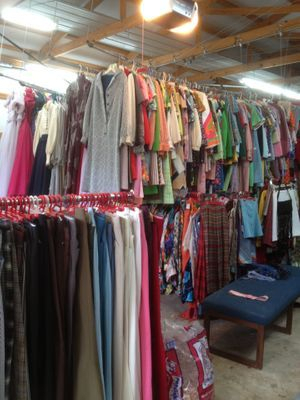 We have a fabulous collection of vintage clothing that works great for theatre productions, decades parties, murder mystery parties, and events. We also sell vintage clothing based on the season and what is back in style. Don't be disappointed if you don't see what you are looking for on our Online Store - it's best to call us - 662-323-9771. We have so much inventory that is not pictured anywhere on the website. Here is a photo of our warehouse. We specialize in 1960s - 1980s clothing. We have lots of vintage to sell if you are interested in buying lots, we would love to help you!